The Gmail Team announced last week a new suite of Postmaster Tools that is spreading positive news through the email community. Historically, Gmail has not offered this much insight into email metrics for senders, just their feedback report which launched a few years back. The Gmail feedback tool only includes aggregated spam statistics, which cannot be traced back to the email address of the individual recipient who marked the email as spam. Google states that these new Postmaster Tools are for qualified high-volume senders, like email service providers, to monitor senders closely. Hop over here to start reviewing key deliverability metrics including data on delivery errors, spam reports, and reputation. To get started, there is a 3-step process to get the dashboard setup. You will need to prove that you own the domain by entering the DNS TXT Record or the DNS CNAME Record. 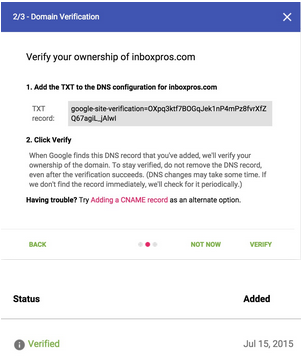 The TXT record should not be removed after Google verifies it. According to Google, it will be tested periodically to confirm the domain still belongs to you. Once it’s verified and emails are flowing, you will be able to access the data Gmail is sharing. Spam Rate – This dashboard shows the volume of reported spam complaints versus email that was sent to the inbox. Only emails authenticated by DKIM are eligible for spam rate calculation. IP & Domain Reputation – The domain and IP reputation dashboard gives a sense of whether the Gmail spam filter might mark emails from that Domain or IP as spam or not. Keep in mind that spam filtering is based on thousands of signals, and that Domain & IP reputation are just two of them. The definition of spam in the section below includes mail detected as spam by Gmail’s Spam filter, and mail reported by users as Spam. – Bad: A history of sending an enormously high volume of email that is considered spam. Mail coming from this entity will almost always be rejected at SMTP or marked as spam. – Low: Known to send a considerable volume of spam regularly, mail from this sender will likely be marked as spam. – Medium/Fair: Known to send good mail, but is prone to sending a low volume of spam intermittently. Most of the email from this entity will have a fair deliverability rate, except when there is a notable increase is spam levels. – High: Has a good track record of a very low spam rate, and complies with Gmail’s sender guidelines. Mail will rarely be marked by the Gmail spam filter. – Average FBL Spam Rate Graph: Shows average spam rate across all identifiers flagged by FBL, on a given day (when applicable) over time. – Identifier Volume Graph: Shows the number of unique identifiers flagged by FBL per day (when applicable) over time. Authenticated traffic – Shows traffic that passed SPF, DKIM & DMARC, over all received traffic that attempted authentication. – SPF Graph: Shows percentage of mail that passed SPF versus all mail from that domain that attempted SPF. – DKIM Graph: Shows percentage of mail that passed DKIM versus all mail from that domain that attempted DKIM. – DMARC Graph: Shows percentage of mail that passed DMARC alignment versus all mail received from the domain that passed either of SPF or DKIM. Encryption – Shows TLS encrypted traffic vs. all mail received from that domain, and consists of two distinct graphs within the same dashboard. – TLS Inbound: Shows percentage of incoming mail (to Gmail), that passed TLS versus all mail received from that domain. – TLS Outbound: Shows percentage of outgoing mail (from Gmail), that was accepted over TLS versus all mail sent to that domain. Delivery Errors – Shows rejected, temp-failed traffic versus all authenticated traffic coming from that domain, within a single graph. Typically messages are rejected or temp-failed with the SMTP error codes 550 or 421 respectively. Click a data point on the table to see the reason behind why the traffic was rejected or temp-failed. – Rate limit exceeded: The Domain or IP is sending traffic at a suspiciously high rate, due to which temporary rate limits have been imposed. The limit will be lifted when Gmail is confident enough of the nature of the traffic. – Suspected spam: The traffic is suspected to be spam, by our systems, for various reasons. – Email content is possibly spammy: The traffic is suspected to be spammy, specific to the content. – Bad or unsupported attachment: Traffic contains attachments not supported by Gmail. – DMARC policy of the sender domain: The sender domain has set up a DMARC rejection policy. – Sending IP has low reputation: The IP reputation of the sending IP is very low. – Sending domain has low reputation: The Domain reputation of the sending IP is very low. – IP is in one or more public RBLs: The IP is listed in one or more public Real-time Blackhole Lists. – Domain is in one or more public RBLs: The Domain is listed in one or more public Real-time Blackhole Lists. – Bad or missing PTR record: The sending IP is missing a PTR record. Email service providers have already started adding all of the domains that are being monitored within their network to the Gmail Postmaster Tool. Gmail’s goal is to provide their subscribers with a spam-free experience and the Postmaster Tool shows just how serious they are about this. Chris Arrendale is the CEO and Founder of Inbox Pros. Chris has more than 13 years of experience in the technology and software industry and has worked directly with many different ISPs, webmail providers, spam filter providers, blacklists, and partners to resolve email deliverability and privacy issues. He works with many leading organizations and enterprises to ensure regulatory compliance and maximum deliverability across all systems.